Koryak Okrug (Russian: Коря́кский о́круг, translit. Korjakskij okrug; Koryak: Чав’чываокруг, Čav’čyvaokrug), or Koryakia Russian: Корякия, translit. Korjakija), was an administrative division of Kamchatka Krai, Russia. It was a federal subject of Russia (an autonomous okrug of Kamchatka Oblast) from 1931 until July 1, 2007, when it merged with Kamchatka Oblast. Prior to the merger, it was called Koryak Autonomous Okrug (Коря́кский автоно́мный о́круг). Its administrative center is the urban locality (an urban-type settlement) of Palana. Population: 18,759 (2010 Census); 25,157 (2002 Census); 39,363 (1989 Census). 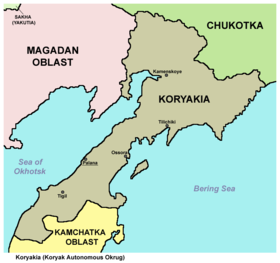 As of the 2002 Census, Koryaks constituted about a quarter of the population. At the time it had the smallest population of all the federal subjects, despite being ranked seventeenth in size, at 301,500 square kilometers (116,400 sq mi), encompassing part of the northern half of Kamchatka Peninsula. About 40% of the total population is indigenous, the Koryaks being the largest such group. They are, however, outnumbered by the ethnic Russians. On April 20, 2006, Kamchatka Peninsula was struck by a major earthquake. The 7.7-magnitude tremor had its epicenter near the village of Tilichiki. The Koryakia branch of the Russian Office of Emergency Situations said some area residents were injured but there were no fatalities. The quake occurred at about noon local time Friday, so residents were awake and not caught in their beds. The United States Geological Survey reported a series of at least fifty smaller aftershocks in the area and immediately offshore. They ranged from 4.1 to 6.5 magnitudes on the Richter scale. Bruce Presgrave, a geophysicist with the U.S.G.S. in Colorado, said the quake was relatively shallow. He estimated that about 2,000 people live close enough to the epicenter to have felt its full force.